Staff Correspondent: Teachers and employees of non-MPO educational institutions have suspended their demonstration for a month on assurance of Education Minister Dipu Moni to meet their demands. Professor Golam Mahamudunnabi Dolar, president of Non-MPO Teachers-Employees Foundation, came up with the announcement to the reporters in front of the National Press Club in the capital on Sunday afternoon. 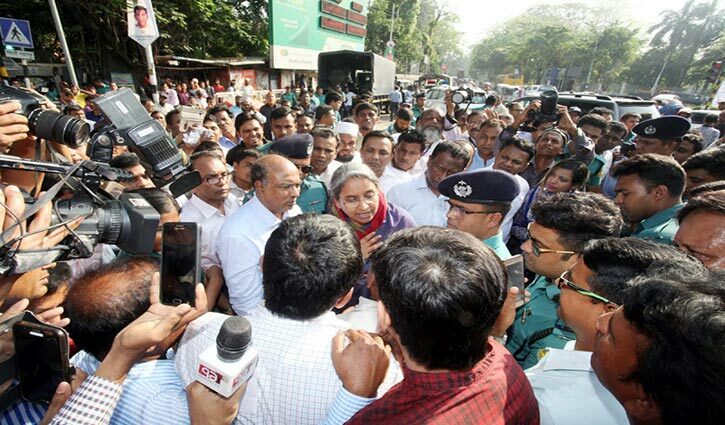 Earlier, around 3:25pm, Education Minister Dipu Moni rushed in their sit-in strike in front of the National Press Club. Teachers and employees welcomed the minister with chanting different slogans. Non-MPO teachers and employees started their demonstrations on Wednesday demanding intervention of the Prime Minister in resolving the issue.